Site: Shallow canyons full of fish life. 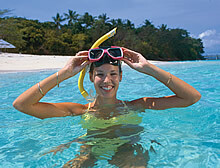 Marine Life: Schooling fusiliers and rabbitfish, sweetlips, snapper, coral trout, variety of clams. Site: A collection of three bommies with the third almost split in two. 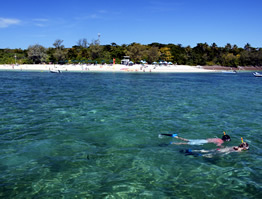 Marine Life: Fusiliers, rabbitfish, sweetlips, snapper, coral trout, soft coral gardens. 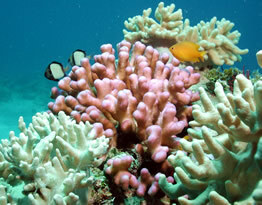 Site: Deep coral formations, swim throughs, often current. Marine Life: Schooling barracuda and fusiliers,coral trout, sharks, turtles and large rays. Site: Drift dive between the Deep Mooring and New York, or in the opposite direction. Marine Life: Schooling barracuda and fusiliers, coral trout, sharks, turtles and large rays.